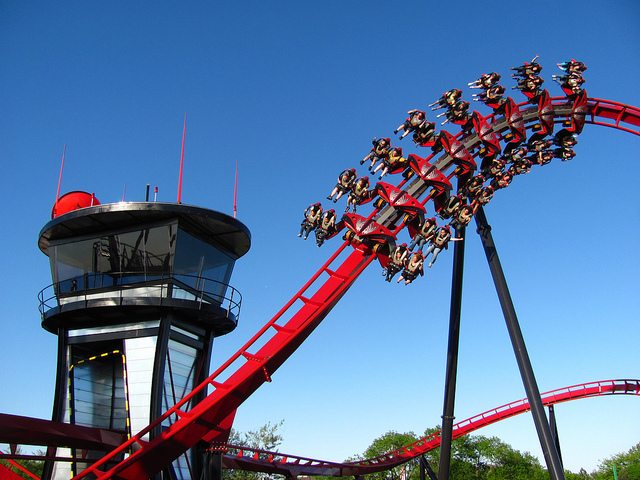 Six Flags Fright Fest is one of the 97 listings of haunted houses in Illinois on Funtober. Great America is one of the Six Flags theme parks located in Gurnee, Illinois about half way between Chicago and Milwaukee. Each October the park re-opens on Friday, Saturday, and Sunday as the ultimate Halloween attraction Fright Fest. Great America is a full entertainment theme park made for the entire family. You can expect rides, a halloween theme, multiple haunted houses, park rules, and lots and lots of people. It is October so expect dramatic weather and temperature changes. The park will stay open during rainstorms however certain rides may be closed. Cloudy, cool, or even wet weather will keep the crowds down which might make for a better experience at Six Flags. Remember the last time you went to a theme park and the lines were two hours for the good rides. Fright Fest has those types of lines so be prepared. If you are looking for the absolute scariest haunted houses then Fright Fest might not be for you. There are other haunted houses on the Funtober directory that will provide a better scare for your money. If you are looking to spend two hours do not go to Six Flags. If you want dollar value and generally complain about prices do not go to Great America. The prices will bother you. Great America has something for everybody but expect to spend some time planning your trip to really enjoy this attraction. See my tips below or return to the Funtober home page. It will cost you lots of money to visit Six Flags Fright Fest. Expect to pay $22 for parking. Expect to pay $9 for a hamburger or slice of pizza and another $4 for bottled water. You can not bring a cooler or drinks into the park. Plan ahead. There are food options near the park so plan on eating before you go into Six Flags. The ticket prices for adult admission is $61.99 at the gate. Save some money by ordering the tickets at the Six Flags website. The saving is $20 per ticket. If there is a chance your group might becoming back during the next summer then look at the season pass. It is a good value. Now here is the kicker. The price does not include admission into the Fright Fest group of haunted houses. They are an extra charge. In the past they cost $10 for each haunted house. In 2012, you could get a $20 ticket for admission to them all. I am not sure at this point what the extra cost will be for 2013. So if you buy a couple of burgers, get a picture and postcard, buy a souvenier then with tickets, parking, and maybe a Flash Pass you are into some serious entertainment bucks. The Flash Pass is their VIP line pass. On a busy day it will save you time but it does cost $50 and up. Six Flags Fright Fest Tip #2: Go when it is slow. Do not go on a warm Saturday in October. Six Flags is usually a busy place. On a Saturday you just might run into another 100,000 people who think Fright Fest would be alot of Halloween fun. The park is open weekends in October. I highly recommend going early in the month and getting to the park early. Plan ahead as it might take you a half hour to park, and another half hour to walk in, get tickets, and pass through security. Then you will have to wait in lines. A cool, overcast day might just be the best time to go. Six Flags Fright Fest Tip #3: Buy the haunted house tickets. Fright Fest has good haunted houses. There are five attractions that open mid afternoon. Some for kids, some for adults, and some for the more adventureous. They are not the scariest in Illinois but as a collection they are good. So you get a train ride, walking woods tour, traditional haunted house, zombies, torture and terror, and the blood in the medical center. These houses are a good scare, lots of fun, and a good variety all in one location. These attractions are entertaining and well worth visiting. Depending on what you like they just might be the highlight of your trip. Six Flags is an amusement theme park. In October it transforms into a wonderful Halloween themed attraction. Even the biggest roller coasters and rides get a name change. Mardi Gras becomes The Last Stop Burn’Em and Buried Circus. You will find the longest lines at these rides with some taking up to 3 hours to get through. My recommendation is hit the entertainment, haunted houses, and lesser attractions before getting in lines for the coaster rides. The park is serious about security. Do not try to bring food or coolers into the park. Drunken or rowdy behavior is not tolerated. On most days Halloween costumes are not permitted for safety reasons. Take your cell phone but wear something with a zipper so the phone can be safely secured in a pocket. I recommend not trying to carry a purse or bag. Usually you can not take a carryon onto the rides. You can purchase a locker to secure your carryons at each ride. This becomes an extra expense and the lockers are only available for two hour periods. Many times people are still in lines when their lockers are timed out and pop open. You can not do it all so do not become upset that you didn’t get to all the rides because of the long lines. Plan the day you go and choose a day likely to have less visitors. After all it is October and most of us who live within two hours are used to October cool weather. Dress appropriately, avoid the crowd and you will have a really entertaining experience. Great America really makes the park a Halloween attractions and has lots of employee-actors dressed to surprise and scare you. Take your entire family, friends, and that special date. Good times will be had by all. Read Best Chicago Haunted Houses In Illinois. Links to other Six Flag them parks around the country. How much are the haunted houses? The Six Flags website has like nothing on Fright Fest yet! My daughters gift was fright fest she is 22 years old, her finance 23 and sister 26,went last Saturday the 15th, it was terrible. They tried to buy a drink at Strutters and a black waitress looked at my daughters drivers Lic and refused to serve her and the other two. They watched her serve a minor with a passport? This is unacceptable , they just got there and was to have a drink to celebrate her bday and were made fools by this black person who was racist to the whites, second thing is my daughter 22 and finance got passes for next year for 4.00’s and my oldest who is 26 did not even get offered this and didn’t receive this offer, I am writing to the BBB and Agriculture Department and further seeking out action against this six flags park. They tried to find security or police there and could not so they could bring this to there attention, if anyone wants to go there I tell you beware I paid a lot for them to go as a bday gift and this is what happens, they are lucky I wasn’t there because this wouldn’t have happened she would have been fired! and pass for 4.00 would have been offered to my other daughter. I am filing complaint with both states on this and writing bad reviews until this gets resolved Who looks over there staff of employees???? No one this is unacceptable behavior by six flags DO NOT GO BIG RIP OFF! STAFF ARE RACIST! Thanks for your tip to check out multiple haunted events like houses and forests during the fall season. I like how you said that you should make sure all your belongings are secure because it’s true- it might fall out when you get scared. My boyfriend and I love haunted houses, and we are looking into reviews of some near us to know which ones will truly scare us!